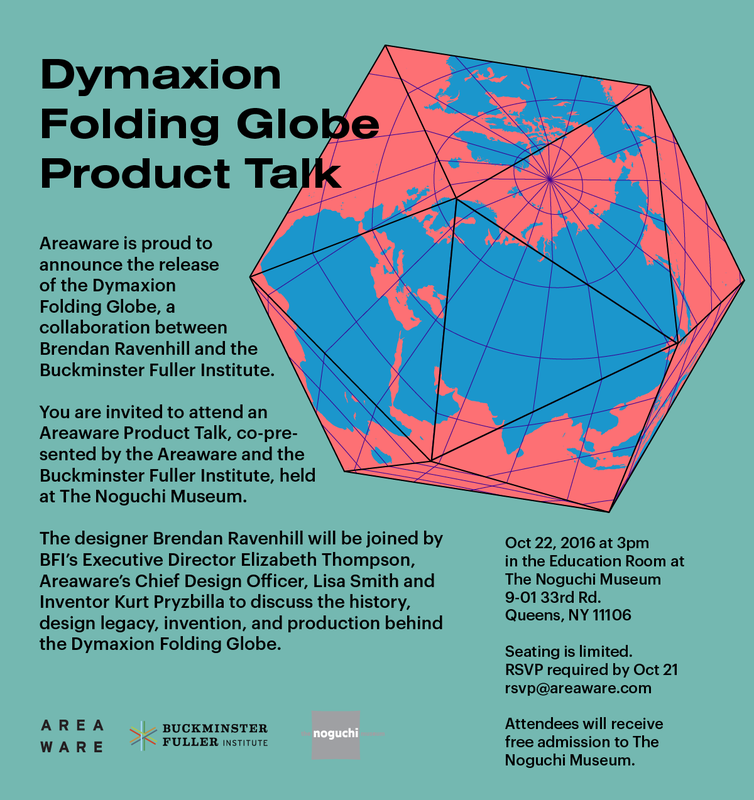 Join us on Saturday Oct. 22 at 3pm at The Noguchi Museum to celebrate the release of the Dymaxion Folding Globe - a collaboration between Brendan Ravenhill and the Buckminster Fuller Institute. The designer Brendan Ravenhill will be joined by BFI’s executive director Elizabeth Thompson, Areaware’s chief design officer, Lisa Smith and inventor Kurt Pryzbilla to discuss the history, design legacy, invention and production behind the Dymaxion Folding Globe. The Dymaxion Folding Globe will be available for purchase in the museum shop. Refreshments will be available for purchase in The Noguchi Museum Cafe following the talk. Attendees will receive free admission to The Noguchi Museum - your donation is always appreciated. Brendan Ravenhill - During childhood in Cote d’Ivoire and summers in coastal Maine, Brendan fell in love with the functional beauty of working tools and wooden boats. His father curated a show called "The Art of the Personal Object" at the Smithsonian when he was a kid and thinking about how and why we use objects has always been a part of how Brendan seeks to understand the world. Brendan first studied sculpture, then wooden boat building, then industrial design--and moved to Los Angeles in 2010. There he discovered the incredible network of fabricators still thriving here, and knew where he wanted to set up shop. For more information, visit brendanravenhill.com. Lisa Cheng Smith is the Chief Design Officer of Areaware, where she oversees product, brand development, and marketing. She joined Areaware in 2014 after 5 years co-running the small-batch design brand ODLCO and teaching design at the School of the Art Institute of Chicago (SAIC). She has a Masters of Design in Designed Objects from SAIC and a Bachelors in Architecture from MIT. She aims to give designers a voice through mass production and bring fringey products to life. Since 2004, Elizabeth Thompson, Executive Director of the Buckminster Fuller Institute, has developed BFI’s leading educational programs including its acclaimed website, high profile public lectures, exhibitions and events, and the Design Science Lab. She has played an instrumental leadership role in the creation and implementation of BFI’s flagship program, The Buckminster Fuller Challenge. Prior to joining BFI, Elizabeth was the founding director of Planetwork, served as director of John Gibson Gallery, New York, and a founding member of the award winning performance group, Cucaracha Theatre, New York. Kurt Przybilla is an inventor, writer, producer, and educator. He invented Tetra Tops®, the world’s first spinning top with more than one axis of spin, which were inspired by the works of Buckminster Fuller and have been featured in the New York Times, Popular Science, Baby Einstein, Child and Discover Magazine, as well as at the Smithsonian Institute. He is co-creator, writer and producer of the Molecularium Project at Rensselaer Polytechnic Institute where he has produced and co-written Molecules to the MAX!, a 3D animated film for Giant Screen IMAX theaters, Molecularium, an award winning digital dome feature, and NanoSpace, an game-based online theme park to teach kids about atoms and molecules.